Before you dive into creating your first Snapshot, make sure you've got Crazy Egg already installed on your website. In case you missed this step, head over to our Installation help documentation, set up Crazy Egg on your platform of choice, and then you'll be all set to start using Crazy Egg! Adding a new Snapshot is simple. There are no domain limitations, you simply add a URL to get a Snapshot for a page you'd like to track. The tracking script is the same for all Snapshots regardless of the domain. It is important to note that Snapshots only track a single page, so if you want to track multiple pages on your site, you will have to create a snapshot of each page by providing the specific page URLs. There are a few different places on your dashboard where you can choose to create a new Snapshot. 1. Click on the + Add New button in the top right-hand corner of your dashboard and then select Snapshot from the drop-down list. 2. On your Home dashboard, select Create a new Snapshot under your Snapshots overview. 3. On your Snapshots dashboard, you can either select + Create Snapshot or click on the + Add new button in the top right-hand corner of your dashboard and then select Snapshot from the drop-down menu. A new window will appear. 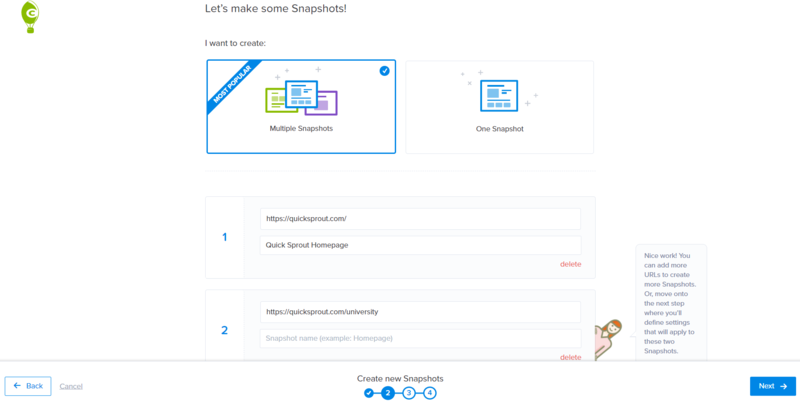 Choose whether you want to create multiple snapshots at once or just one snapshot by clicking on the corresponding image. In this case, I chose multiple snapshots. You can paste the URL in the first field and then specify a Snapshot name in the second field, if you choose. Scrolling down on the page will allow you to add more URLs for new Snapshots. Remember, a Snapshot is an analysis of one page so if you'd like to analyze multiple pages on your website, you'll need to add in all of the different page URLs. Now that you've specified the pages you'd like us to track, it's time to tailor the data to your needs. Choose what device view the Snapshot will take. For example, if you choose the desktop image, your Snapshot will capture a screenshot of your page as it looks viewed on a desktop. To choose a tablet or mobile device, select one of the other two options. This is an important step if your website looks drastically different on various devices. Note: Once you choose the Snapshot device view, you can't change this option in the future. You will need to create a new Snapshot with a new device view selected. Under Track Traffic From, you can choose either the same device type you did for the screenshot capture or select a combination of different devices. We default the choice to all three so that you never miss any traffic sources. Note: If your mobile and tablet layouts are similar to your desktop website layout, then it is a good choice to have all three selected. Even though certain elements may not overlap entirely, we are able to map these elements so they correspond across devices. You can see this in your Confetti Report once the data has been gathered. If you would like to experiment with this feature, head on over to our Reports Demo. From this same window, you can edit when you want your snapshot to start and end. Underneath the Snapshot scheduling options, you'll see a menu that you can enlarge titled Show more settings. These allow you even more control over the type of data that Crazy Egg pulls in. Note: When you create multiple snapshots at once, you will not have access to all of the advanced Tracking Options as you would under a single Snapshot creation. Click Next when you are finished with your settings. Now you'll have a chance to review your Snapshots before they go live. If you want to make any changes, click on the Back button. Otherwise, click on Create # Snapshots. Note: The status of your Snapshot will first appear as Pending. It will remain in this status until our server has had the opportunity to go out to your website page, capture a screenshot, and process the information. Once this is complete, your Snapshot status will change to Running and information will be collected as visitors explore each page. Your Snapshot status will only switch to Running when at least one visitor has visited your page. If you opt for a single Snapshot, most of the steps will be the same as when you choose multiple Snapshots with a couple of exceptions. The first difference is that you can opt to create three different Snapshots for each device and that device's corresponding traffic. You'll end up with a Desktop view with Desktop visitors Snapshot, a Tablet view with Tablet visitors Snapshot, and a Mobile view with Mobile visitors Snapshot. The second major difference is that you will have access to additional Tracking Options. Now that you've got your Snapshots running, it's time to check out the Reports! You will have five different types of reports to explore: Heatmap, Scrollmap, Confetti, Overlay, and List. Take a look at our Crazy Egg 101: 4 Steps to a High Converting Website guide to learn more about what you can accomplish with each of these Snapshot Reports.